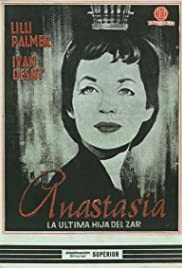 One of the two films made in 1956 about the woman who claimed to be Anastasia. The psychologically unstable Anna Anderson is played by Lili Palmer, who does a great job. Palmer's performance is more or less the only feature of this film The film never achieves a dramatic atmosphere; the film only shows a great number of encounters with people who do or do not believe that the Anderson woman is Anastasia. Script writer Reinecker made be praised for not being tempted to introduce false romance (as the Ingrid Bergman version), on the other hand he could not make the script into a flowing story. Falk Harnack's direction is decent, but does not do much to overcome this main weakness of the script. The film is interesting as a typical 50's event and can be regarded as an expression to the political situation between "west" and "east". The film's sympathies are clearly on the side of the Anderson woman; this is accentuated by the fact that the discovery by a German newspaper that she was the Polish Franziska Schanzkowksa is without much ado dispensed with in a short and ridiculous scene. Since the DNA research in 1995 we definitely know what to think of the Anderson woman and of all those Russian exiles who wanted to believe; I must say, knowing this makes the performance of Lili Palmer even more compelling viewing.